If you live in a colder climate, the chances are that you may feel the chill during the winter months. Heating your home is an expensive process and we don't always have the money to cover this extra outgoing. If you take some care to examine your insulation quality, you can start to reduce the costs of heating whilst retaining your interior heat levels. Here we look at the ways in which you can stop heat escaping and cold air invading your family home. A huge amount of energy is lost via badly hung doors, but you can remedy this easily. You should buy some decent draught excluders and install them around your exterior doors. Sealant strips are a cheap way of ensuring that air does not leave your home, nor will the cold air worm its way under your door. Letter boxes can allow cold air and wind to invade your hallway, fir some brush trim to minimize the unwelcome guest from your family home. So much air can enter and exit via poor conditioned windows. You can check for suspect areas by simply passing your hand over these frames during a particularly windy and cold day. As soon as you experience a breezy window you can apply some sealer or putty to remedy the situation quickly. If you have the available funds and you think that your windows have seen better days, why not consider installing double glazed units? You will soon feel the benefits in your reduced heating bill, but you may be surprised by the noise reduction as an added bonus. Check your skirting boards and will probably notice some large gaps; these are costing you serious money. Buy some silicone sealer and start to fight back against the cold invader. If you have laminate flooring, you could add some insulation, but ensure you do not damage the product. You may also wish to consider a swish rug as this will trap most of the cold air before it enters your room. A huge amount of warm air is lost when your attic has poor or no insulation installed. By laying a decent layer of glass wool over the floor area, you can save one tonne of carbon dioxide per year. This product is very cheap and is fairly easy to install, it is also recyclable. 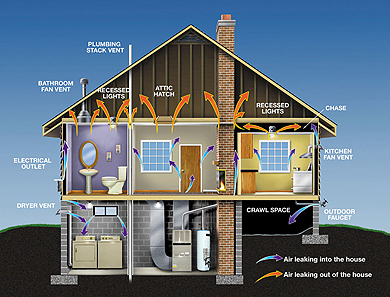 You may be surprised to learn how much warm air is lost by an uninsulated hot water tank. Why not fit an eighty millimetre warming jacket and enjoy the extra seventy five percent benefit that will come your way as a result. Cold wall describes a non-insulated concrete wall and these can feature heavily in older houses. A large amount of heat can escape via this route and you will be wise to pay some attention to this culprit sooner rather than later. Simply assemble a ten millimetre dry wall to the surface and this will suffice by blocking the access route soundly. To make sure that your home is insulated efficiently contact Sandium Heating and Air for a whole house energy audit. We're renovating our home, and among many other things are updating AC and insulation. Warminster air Conditioning in our area gave us a great price. These are all really great tips we'll be sure to follow! You gave some great advice! A lot of people don't take account that their enviornment pays a huge roll in things from insulation to setting a thermastat. You want your house to be as efficient as possible. For instance, an air conditioner in Baltimore MD may be used more than an air conditioner in Buffalo, NY.